How do you expect to learn WordPress development if you will never open a file in a text editor? 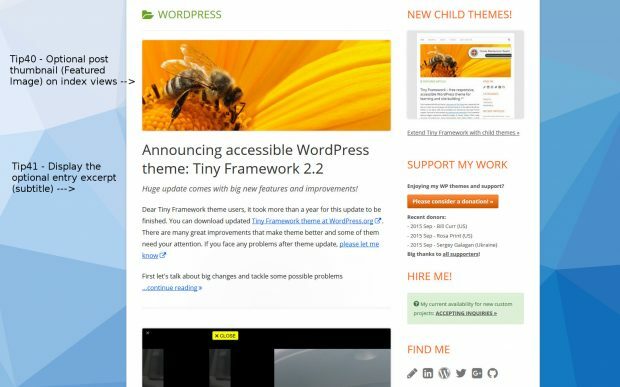 After answering many user questions on WordPress support forum, I compiled a comprehensive guide on how to use Tiny Framework/Forge WordPress theme and its child themes. I hope it will give you a confident start and encourage you to begin your own coding journey! Learning WordPress coding. The concept of "Tips". Task 1: Use child theme or not? With its unique "Coding Tips System" Tiny Framework helps to understand how to extend parent themes and build your own child themes, hacking them the way you want. 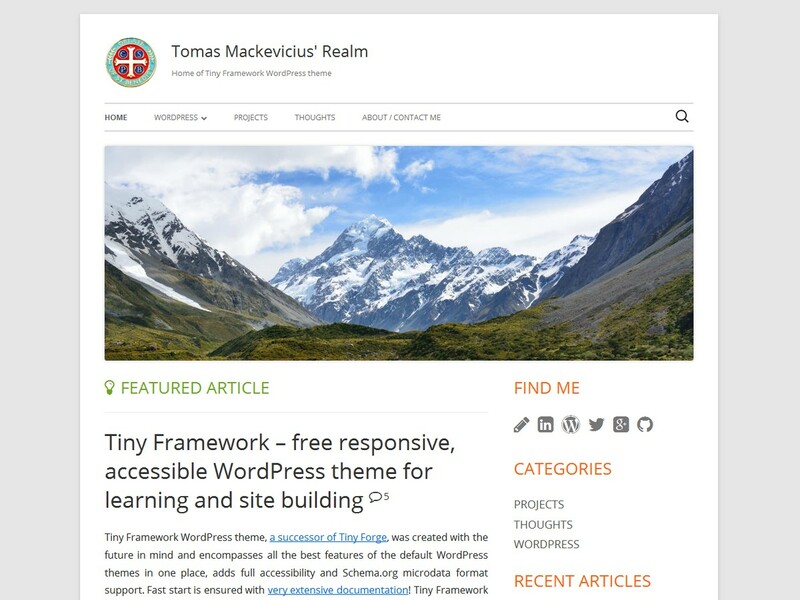 This WordPress theme does not offer million customization options, how do you expect to learn WordPress development if you will never open a file in a text editor? Instead Tiny Framework has small pieces of code that (un)locks various features and lets you do things yourself by guiding you through the files and code lines. Coding Tips are baked in the theme itself. Tutorials cover less common features. Child theme example will provide you a solid starting point and teach most important child theme development techniques. Tips and Tricks. Take advantage of this free 40-video WordPress Beginner course on YouTube! Tip40 - Optional post thumbnail (Featured Image) on index/archive views (style.css, inc/template-tags.php , template-parts/content.php) - can also be used in child themes. Tips and Tricks. I recommend using free Notepad++ editor. You can open all theme files in this editor and easily search for Tips across all open files. Why should you consider using a child theme? The way WordPress works, each time you update a theme, its folder would be overwritten with new version. That means if you want to make changes to the theme and retain them, you have two choices: use a custom CSS plugin, where you would store all new CSS styles, or use a child theme, that you would modify. First choice is good for users who will do only small changes, that can be achieved by modifying CSS styles. In this case you would append new CSS styles with the help of a plugin. If you're using popular Jetpack plugin suite, it has a Custom CSS module, other plugins to consider: Advanced CSS Editor (recommended), Simple Custom CSS, Improved Simpler CSS. With the arrival of new theme version, you could update theme, because all your custom CSS styles would be safely stored in the database. Tips and Tricks. Don't know what CSS rules apply to what website element? Open new page in your web development book ant start usining Firefox Page Inspector (a part of Web Developer Tools in Firefox) and/or Google Chrome DevTools (also check this page) to see what styles are affecting the web page elements. You can activate these tools in both browsers with: CTRL+SHIFT+I and select the element you need with the mouse. Similarly you can use F12 Developer Tools in Internet Explorer with F12. See video tutorials about Firefox Inspector, Chrome Developer Tools and Internet Explorer F12 Developer Tools. How to install a child theme. First you have to download main theme - official release or latest development version. Unzip parent theme file and then locate child theme files in: inc/examples/tiny-framework-child. In this case zip the child theme folder and upload the zip file! Activate Child theme and you're ready to go! From that point all of your changes will be done in the child theme. If you need to modify a file, but it isn't present in your child theme's folder, just copy it there from the Tiny Framework theme. As a bonus, Tiny Framework child theme has very nice search field in the top menu area (ported from Twenty Thirteen theme) and two new header images to give you an example on how to change the default header images in the child theme. To activate search field you have to create a menu and assign it as primary, see: Task 3: Theme Customizer options. Tips and Tricks. 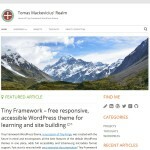 Tiny Framework is a mobile-first theme. Because of this, main part of the style.css describes the overall mobile look. Styles provided in media queries at the end of style.css (sections 15.0 - 15.4) introduce changes for other (larger) screen sizes. Try to resize your browser window to see how the theme changes its look in relation to screen/browser window size. Go to Theme Customizer and see if you need to change any visual aspects of your site. If you already created a menu, assign it as primary in Navigation. At the top see: "Select a menu to edit, or create a new menu." 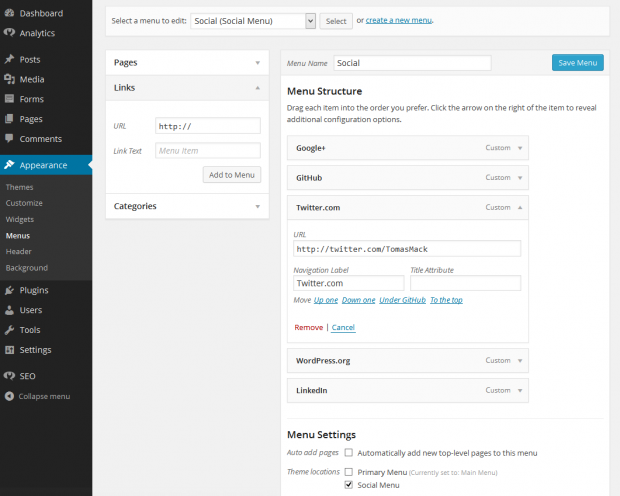 and create a menu if it's a fresh WordPress install. Then at the bottom check "Theme locations: Primary Menu" and save the menu. For info about customizing Site Header and custom logo please see: Header and logo configuration options. Using this method (created by Justin Tadlock) you would create new menu, name it "Social" or other name and assign it as "Social Links Menu" (the check box at the bottom). Then you can add your social profiles as Links. By default social icons would be displayed on the right side of the footer. If you want to change the way Social Links Menu is generated, check the inc/menu-social.php, also search for Tip85 in style.css and footer.php. If you want to display Social Links Menu in the header, see Tip85b. Search for Tip86 in style.css to adjust CSS style. Read more about icon webfont implementation. Check if you need to enable (uncomment) any of the functions there. If you enabled humans.txt meta tag, open inc/humans.txt file in text editor and update it with your own information. Read more about humans.txt initiative. Clean look on the left, original on the right. To disable entry meta, located below the post in index/archive view, open style.css file in a text editor and search for Tip30, then uncomment next CSS block to hide entry meta section (with author, categories, tags) in the Index page and archive listings. 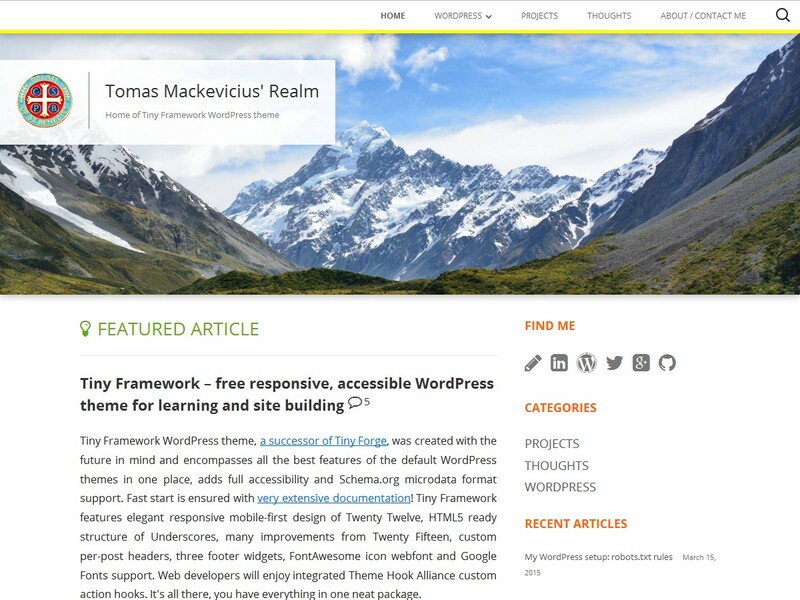 As you probably noticed, accessible WordPress themes have special "accessibility-ready" tag. It basically means that this theme produces accessible website on clean WordPress installation. It also means, that after some user actions website might not be fully accessible anymore. That's right, website owners can negatively affect accessibility of their own websites. Here are several precautions and tips to keep your website accessible. Headings play a big role in providing web accessibility and can have potential impact for website's SEO. Knowing that, users should use headings in their produced content following main heading structure of a theme. H1 is reserved to describe one most important item on a page, usually post/page title. H2 is used to outline main website document structure and H3 is used to describe less important page elements, like widgets, etc. Tiny Framework users should use headings in posts and pages starting from H2 and starting from H4 for the content inside the widgets. Use headings in a consistent manner, don't skip or mix them up, eg. Basically, you have to start with highest heading (H2 for content and H4 for widgets) and then use lower importance headings if needed. If you would think that visually lower importance heading, eg. H4 looks better, you would not use H4 after H2, but instead you would alter the CSS style of H3 to match your needs. This would give you the desired look and would not break the logical structure of a document. If you will decide to change color and/or background of text elements, always check if new color combination conforms to web accessibility requirements. This requirement is also valid for the states of a text or link: :hover, :focus, :active, :visited. If you upload images that add value to the content, please do not forget to provide Title description and/or Alt Text description in media uploader. If Alt Text field of media uploader is empty, WordPress will use Title field instead. So at least one of the fields should be provided. If you will use alert boxes, apply alert-link class for the links inside alerts. This might help you when applying CSS rules to see the "Cascades" of Cascading Style Sheets. Archive example for category.php (different is only #primary). Open style.css file in a text editor and starting from the beginning, search for "Tip88" to quickly find CSS rules responsible for the colors of main theme elements. This can be done faster by using LESS. 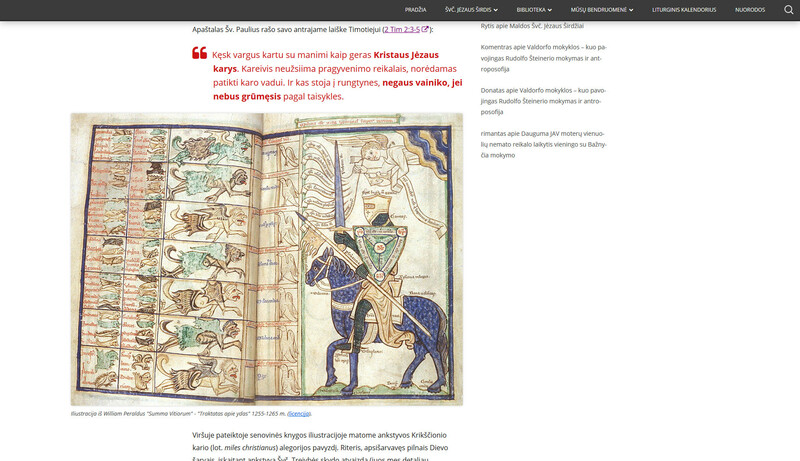 In this example I will alter CSS rules and some theme files (indicated by bold text) to make site 1200px wide. To achieve this, content area should be 1120px wide. If you're using Tiny Framework without a child theme, find these style.css file sections and edit/append the code. /* Adjust content width in certain contexts. * Adjust content_width value for full-width and single image attachment templates, and when there are no active widgets in the sidebar. * template_redirect fires a lot later than after_setup_theme so that will still change the variable as usual. For the child theme, you will have to copy this modified tinyframework_mod_content_width function. To maintain logical structure of the child theme's functions.php file I would put this and next function somewhere in the section: 1.0 - Parent theme's functions you can override. * 3.0 - Theme setup - Part 1. Your self-hosted site runs WordPress 4.5 or newer version or site is hosted at WordPress.com. If you have self-hosted site that runs older WordPress version, you have to install Jetpack plugin. Then go to Customizer and under Site Identity (used to be Site Title & Tagline) you can upload an image to use it as custom logo. I recommend to size the custom logo height to 85px. If you want to have a larger custom logo, that might even span through entire width of the Site header, just upload wide image (960px to span entire header). By default in mobile view custom logo is hidden. This is very practical decision - it's impossible to predict the parameters of user-uploaded Logo picture, so to avoid a distorted look, custom logo is hidden. Nonetheless if you want to enable it, it's just a few CSS lines away. Open style.css in text editor, search for the Tip14 and uncomment block of the code marked as "Enable custom logo in mobile view". Select Featured Image for every page/post. 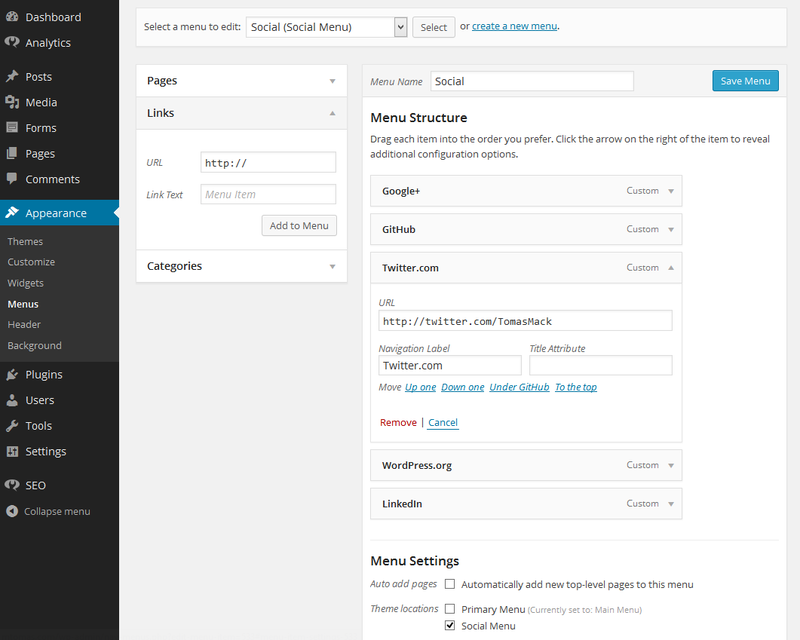 There is a menu box on the right sidebar of WordPress page/post editor. Upload or select from Media Library an image that would be at least 960px wide. Those pages and posts that do not have Featured Image assigned will display main header image that was set for the whole site in Customizer. Tips and Tricks. If you do not see some menu box of the page/post editor, scroll up to the top of the editor screen, where you will find Screen Options button. A known Jetpack bug. If you cannot assign Featured Images, one of known problems is caused by the Jetpack module Photon. You have to deactivate Photon to make Featured Images work. Read more about Jetpack Photon bug. then select the option: "Randomize headers". All pages and posts that do not have designated Featured Image, will show those header images. Same applies to categories. If you want to replace default header images with your own, look at the images/headers inside the theme folder and replace images keeping their names the same. 'id'       => 'featured-image', // Experimental! This ID (should it be #post-thumbnail ?) could be used for the itemref in the article element (in inc/semantics.php) for the Google AMP Articles Rich Snippets "Article image" validation. Overall if you need to upload a header image with a different height than default one (350px) you do not need to do anything special, just upload the image and it will work. This tutorial is for those, who want the image cropping tool to be automatically sized to new height. It might be useful for your client to make site look uniform. In the functions.php file of your child theme search for: 2.3 - Tip07 - Add new image size for custom post/page headers and select default header image. and change that number to your desired height, eg. 150. First copy header.php file from main theme to a child theme. By default top menu is 4 levels deep, in other words it can have a maximum 3 levels of sub-menu items. If you would create a sub-menu item deeper than that, it would be hidden. This restriction was made to prevent very deep menus with long item names being cut off and displayed behind the viewport/visible screen area. It is especially possible if top menu item is in the right corner of top menu. and change depth value to 5 or some other number you need. Just open related to the tip files in a text editor and search for a tip number, for example "Tip03" to find the code. Create a link menu item with any link address (you should enter something there, otherwise WordPress will not let you to create the menu item). When it is already created, edit it by deleting the link address. Sometimes you have very distinct categories on your site, e.g. Blog and Events. By default at the bottom of a post the links to Next and Previous posts would be provided chronologically - from any category. Logically if your user is reading an article about event, you would like to display the links to other articles about events. To make this theme customization, you have to edit single.php file. If you're working with a child theme, copy single.php from Tiny Framework and then look in the file for a Tip91 for further directions. If you're using Tiny Framework without a child theme, find these style.css file sections and edit the code. If you're using Tiny Framework with a child theme, first you will have to uncomment these sections and then edit them. Remember, that by increasing the width of the content area, you have to decrease the width of sidebar widget area by the same amount, otherwise whole sidebar will be dropped to the bottom. As an example, you could use values of: 75.104166667% and 20.5%. 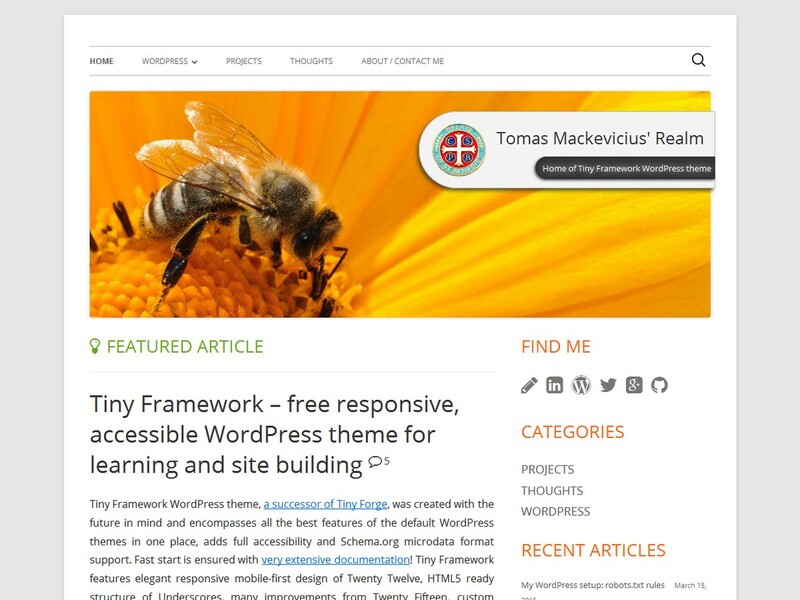 This example is provided for the child theme, if you want to use it in Tiny Framework, replace tinyframeworkchild with tinyframework. Code related to this tutorial is marked as Tip40 - Optional post thumbnail (Featured Image) on index/archive views (style.css, inc/template-tags.php , template-parts/content.php) - can also be used in child themes. You can enable it in style.css - search for "Tip40". Further style adjustments can be made in style.css. Instead of medium you can also use thumbnail, large, full or a custom thumbnail size name that you can create in functions.php - search for the "Tip07". Since v1.5.4, Tiny Framework theme sanitizes title fields. That basically disables HTML code parsing in title field. If you really need this ability, below are the steps to enable HTML in title fields. A word of caution. Why it is a good idea to leave title fields sanitized? When user enters not correct HTML in the content, it gets automatically fixed by WordPress, of course if it is enabled in Writing Settings under Formatting "WordPress should correct invalidly nested XHTML automatically". But if that would happen in the title field, it would be not fixed, so user could potentially break the design of whole site. It is also possible that in some cases it could affect the security of your site. // $title = esc_attr($title); // Sanitize HTML characters in the title. Comment out this line if you want to use HTML in post titles. If you use Tiny Framework with a child theme, open functions.php of a child theme in a text editor, find section 1.3 (Allow HTML in post title...) and uncomment tinyforge_the_title_trim function. Personally I do not like to be limited with "Back" button, because it creates a linear browsing experience, people are surfing internet in many directions these days. If I think that it would be a distraction for a reader to open link in the same window (because reader would have to go back and find where he left the article), I would always use target="_blank". But when you have a situation where readers would have certain vision and other disabilities, opening link in a new window is not a good thing. Even in this situation Tiny Framework tries to do the best - it displays "external link" icon - gives visual warning to reader and behind the scenes displays special comment for screen reader software: "Opens in a new window". Tiny Framework appends nice icon to the links set open in a new window, indicating to the user that it is an external resource. But in some cases it is not the desired behavior, especially when linking images, see the example. If you want to disable external link icons for all content links of your site, please lookup Tip25b in style.css. Tip40 - Optional post thumbnail (Featured Image) on index views (style.css, inc/template-tags.php , template-parts/content.php) (can also be used in child themes). See the image below. Tip41 - Display the optional entry excerpt (subtitle) below the entry title (style.css, inc/template-tags.php , template-parts/content.php) (can also be used in child themes). By default this is disabled, because some people might use entry excerpt for other purposes, find Tip41 in style.css to enable. Please see the instructions at: Make content area wider or narrower. should be removed and Sidebar will disappear automatically. If you want to remove a Sidebar for an individual page (this works only for pages, not for posts), in the page edit screen take a look at the Page Attributes menu section on the right side. There you can change a page template. In Template menu select the template named "Full-width Page Template". This should be done for each individual page that you want to use without a Sidebar. Tips and Tricks. For more customized sidebar control I recommend using a plugin. If you're using popular Jetpack plugin suite, it has a Widget Visibility module, other plugins to consider: Dynamic Widgets, Content Aware Sidebars and Widget Options. To achieve this we need a simple CSS statement placed in style.css at the very end of section 3.6 Footer or at 14.3 Other styles. Check style.css file for more button styles. All related CSS styles you will find in style.css section 14.1. Tiny Framework uses Twitter Bootstrap style alerts. To add an alert to the post, create a div with specific CSS classes. class="alert alert-success" Please write your comments in the box provided below and it will be posted automatically upon submission. This space allows everyone to engage in a transparent and productive discussion. class="alert alert-info" Please write your comments in the box provided below and it will be posted automatically upon submission. This space allows everyone to engage in a transparent and productive discussion. class="alert alert-warning" Please write your comments in the box provided below and it will be posted automatically upon submission. This space allows everyone to engage in a transparent and productive discussion. class="alert alert-danger" Please write your comments in the box provided below and it will be posted automatically upon submission. This space allows everyone to engage in a transparent and productive discussion. Default link colors, if used in alerts, would not comply with web accessibility text contrast requirements, that's why it's better to use alert-link class for the links inside alert boxes. In the theme and CSS style files I provided some examples on how to use icon webfont - search for icon-webfont class name and Tip21 (icon webfont support implementation and examples in style.css, category.php). Also please check: Icon webfont for social networks. CSS class names for other icons may be found in /css/font-awesome.css file and at: Font-Awesome icons (click on each icon to get detailed information). Everyone wants website run faster. Overall loading CSS is recommended from your own domain - it is faster, because DNS will be resolved once. But every case might be different, so if you need to use CDN, just open functions.php and see Section: 5.2b (Section 2.6 in child themes). You can always invoke document icons with classes on any HTML element: icon-pdf, icon-word, icon-excel, icon-powerpoint, icon-archive-file. To make things even better, you can enable automatic icon placement on any link to a document! No need to manually add CSS classes, etc. Open style.css, find Tip23 and uncomment next block of CSS rules. First way is to use BootstrapCDN version of Font Awesome icon font, check Section 5.7b of functions.php (Section 2.6 if you are using a child theme). Most likely you will have to exclude this file, so it will not be loaded by your primary CDN service provider, check your CDN's manual how to do that. Second way is to use special .htaccess rules, see: Serving Fonts from CDN. To embed code in the post, first it should be escaped. For this purpose use simple, but effective online tool Postable. To embed in-line code, just select the escaped text and use editor's code button to get this Bootstrap-style appearance: .sample-class Some small parts of code may be used without escaping, but if you don't know exactly, it's always better to run your code through linked tool, just to be sure, that you will not break your site. // Adding CSS file of the Child theme. Tiny Framework integrates Theme Hook Alliance hooks and ads one more action hook example, see Tip87. Attention Tiny Framework translators, there is an easy way to translate Tiny Framework to your language. Tiny Framework translation templates can be found at: translate.wordpress.org. Most likely some of the strings will be already translated, you will have to translate only the remaining part 🙂 Just click on your language and start suggesting translations for the strings. You may also find useful to read the GlotPress translator handbook. Please note, that two strings: on and no-subset should not be translated into your own language, but copied over as it is in English. For some languages no-subset should be translated as the subset name, like: greek, cyrillic, devanagari or vietnamese. Welcome to rapid development age - change the look and feel of your site in minutes! LESS support is provided via child themes, file located at: /css/style.less. As you can see, from the very beginning you are presented with a clear list of many visual and functional aspects of the theme. You don't have to search whole style sheet to find the code, in 5 minutes you can cardinally change your theme! Don't know how to use LESS dynamic stylesheet language? Start reading here: Get Into LESS: the Programmable Stylesheet Language. Also see this video about LESS and other CSS preprocessors: CSS preprocessors with Jonathan Verrecchia. Check the GUI compilers that use LESS. I prefer WinLess, because it uses latest version of Less.js and has clear compiler error messages. Do not forget to replace original style.css file with the generated one or set the output path of the compiler to your main child theme folder, so original style.css file would be overwritten automatically. Template option might be even missing from the edit screen. In my experience, it is not theme related. First, check if default WordPress theme is installed (in this case it would be Twenty Fourteen). Activate default theme and then try to select any page template. After that revert back to your theme and since then everything should work normally. Also try to see if you cannot select a template from page edit screen and from general Pages screen where you can do "Quick Edit" and select template there. To diagnose this issue, disable all plugins, see if navigation is working in mobile mode. Then try to re-enable plugins one by one, constantly checking mobile menu, until you will find the conflicting plugin.